If you would like to know when your current Dashlane Business cycle ends, and when your subscription is set to renew automatically, simply visit the Admin Console at console.dashlane.com and navigate to the Account → Account Summary tab. Alternatively, you may click here in order to reach this tab directly. 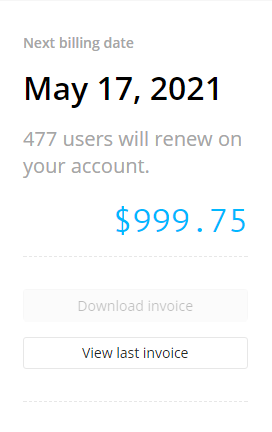 There, scroll down to the bottom of the page where you will see your upcoming renewal date and find your past invoices. On the renewal date that you will find there, any Dashlane Business seat allocated to a Dashlane user will be renewed automatically and your new Dashlane Business billing cycle will start.